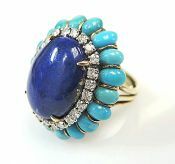 Discover our Selection of Antique Lapis Rings, Estate Lapis Rings, Vintage Lapis Rings and Modern Lapis Rings. For a Custom Lapis Ring Design Click Here. Lapis Lazuli is an Opaque Royal-Blue Stone with Gold-Coloured Pyrite Streaks. One 10 karat yellow gold filigree ring. One fancy shaped lapis. One 18 karat yellow gold ring. One oval cabochon lapis (6.65 carats). One 14 karat yellow gold Etruscan filigree ring. One oval cabochon lapis lazuli (5.13 carats). One custom-made 18 karat yellow gold ring. One lapis lazuli (10.44 carats). One 14 karat yellow gold ring. One round cabochon lapis lazuli (3.26 carats). One 10-14 karat yellow gold solitaire. One wreath bezel-set lapis lazuli (1.78 carats). One 14 karat yellow gold solitaire. One oval cabochon lapis lazuli (8.33 carats). One custom-made 18 karat yellow gold ring. 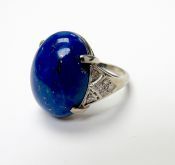 The stylized leaf-like ring is set with one oval cabochon lapis lazuli. 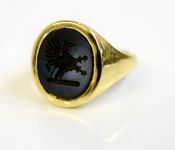 One twenty-two karat yellow gold ring. One oval cabochon lapis lazuli.